Terrorist stabs IDF soldier near Ramallah, authorities say he planned to carry out suicide attack near Israeli soldiers. An Israeli Border Police officer was stabbed by a Palestinian Authority Arab during riots near Ramallah, a police spokesman reported. The terrorist pulled out a knife and stabbed the Border Police officer in the shoulder. The officer, who suffered moderate injuries, was treated at the scene before being transferred to Shaare Zedek Hospital in Jerusalem. Border officers responded to the stabbing attack and shot the suspect, neutralizing him. Approaching the terrorist, the officers realized he had an explosive belt, and shot him a second time to prevent him from detonating it. The terrorist was later taken from the scene by the Red Crescent medical service after being wounded by the IDF fire. Authorities suspect the terrorist disguised himself as a journalist before running up to the Border Police officer and stabbing him. Earlier on Friday, a Border Police officer was lightly injured when Arabs threw rocks at him near the Binyamin-region town of Nili. Border Police officers waiting on the Gush Etzion-Hevron road arrested an 18-year-old Palestinian Authority Arab who was throwing rocks at passing cars. 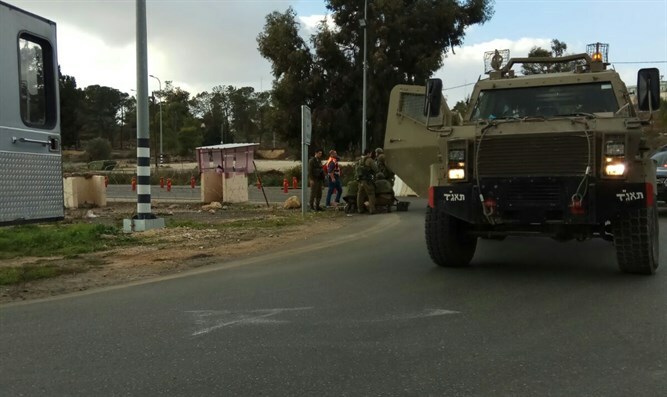 In addition, two Israelis were lightly injured by rock-throwing Arabs at the Hizme checkpoint near Jerusalem, when they arrived in the area to wash their cars. The victims were treated at the scene. In the Hevron area, approximately 2,000 Arab rioters clashed with security forces. Riots also began in both Qalandiya north of Jerusalem and Tulkarem in the center of the PA-controlled areas, as well as in the Arab city of Al-Bireh near Ramallah, where Arabs burned tires. Rocks were also thrown at vehicles driving near the Shechem-area (Nablus-area) Jewish town of Yitzhar, and one car was lightly damaged. On Israel's Highway 60, Arabs threw rocks at passing Israelis. No one was injured and no damage was caused.